Sunrise hike to Mt. 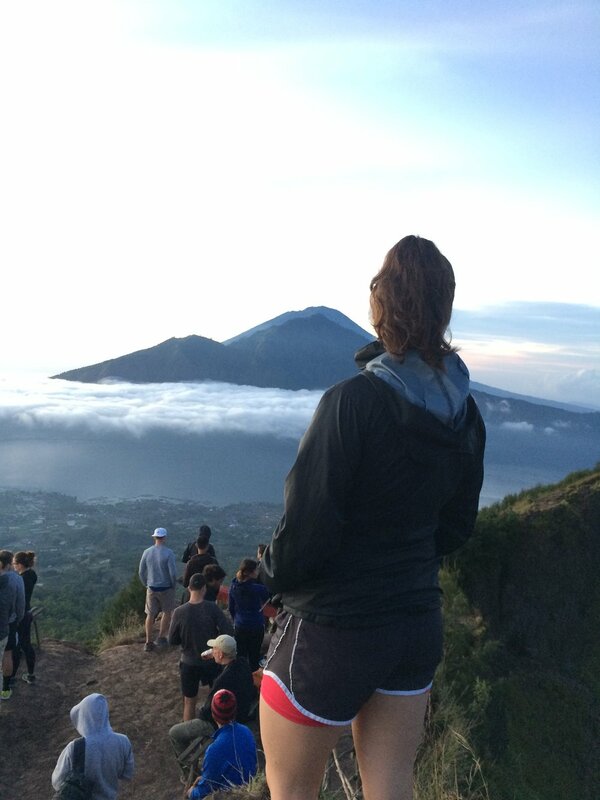 Batur -- check. What a day. We successfully wake up for our hotel pickup at 2:30 am, but are so sad to leave our magical palace. We sleep for the hour long drive to Mt. Batur, arriving at the starting point while it is still dark. The hike begins with a small group - all of us wearing headlamps - at 4 am, lead by a Balinese guide who does this all day every day for a living. I am in shorts and Nike’s, Kev is in hiking boots and adventure pants. Within 30 minutes, we lose two of our group members to fatigue and food poisoning (by lose, I mean they turned around!). The guide is keeping a quick pace and in the dark, it’s hard to tell how far we’ve gone at all. We emerge from the trees and it looks like you can see the top of the mountain hanging out up there in the starry sky, and from our vantage, it looks a quick 30 minutes to the top. Wrong. We hike for at least another hour, with the terrain steadily getting steeper and rockier. There’s just the faintest amount of light creeping into the sky now, and I’m literally dripping sweat. The view from the top of Mt. Batur before sunrise. Finally, we make it to the top, where hundreds of other hikers are trickling in and plopping down on the sparse few benches overlooking the view. As our internal temperatures begin to normalize, we realize... it’s very freezing up here. The sun is still taking its sweet time to clear the horizon, and with the wind blowing, we eat our “prepared breakfast” of hard boiled eggs (cooked in natural steam pockets), dry bread, and stone fruits. Batur was a good example of how we (I) could have better prepared for my sometimes high-maintenance travel needs. Wondering why I didn't bring a warmer jacket to go sit on top of a mountain. Pro Tip I: Jacket, hiking boots, sunglasses, and a backpack filled with water, snacks, and cash - these are things that would have made the experience more enjoyable, but that I didn't bring in the name of minimalism. As much as I love the concept of “less is more,” I’m just not that easy to please. Pro Tip II: Go to the bathroom before & save water for the top! There are no bathrooms until you near the end. We were so lucky to have this perfect weather for our climb. The experience of watching the sun rise over the ocean and finally witnessing the view was unforgettable. I was proud of us for our accomplishment! We woke up early on vacation and worked hard to get to the top of that mountain. But now for the walk down. This was easily the most treacherous part, because the path was pure rubble that slipped and slid under each step. Luckily I had Kevin to cling onto for most of the way, and made it without a single fall. But it wasn't easy and I was tense the whole trek down. Cuddling up next to the natural steam pockets for warmth. 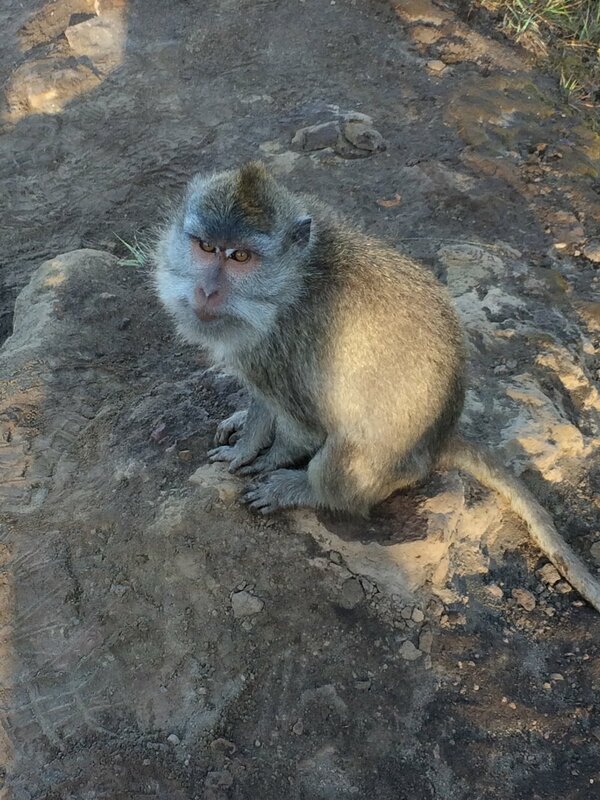 Met a few more monkey friends on our way down the mountain. These ones were a bit less scary. Pro Tip III: We wouldn't recommend going if it’s rainy or even cloudy. You’ll have completed a very strenuous hike for just about nothing. Even if you’ve put money down, maybe just ditch the other half of your deposit at that point. The view is what makes everything worth it. From there, we were joyfully reunited with our bags, which (in a leap of faith) we had entrusted with the tour company. We set out on our shuttle to the town of Amed, which only upon getting in the car did we learn was about 2.5 hours away. Thus began our winding ride through the countryside and small towns of Bali. This was a really cool way to see the "real Bali." Mt. 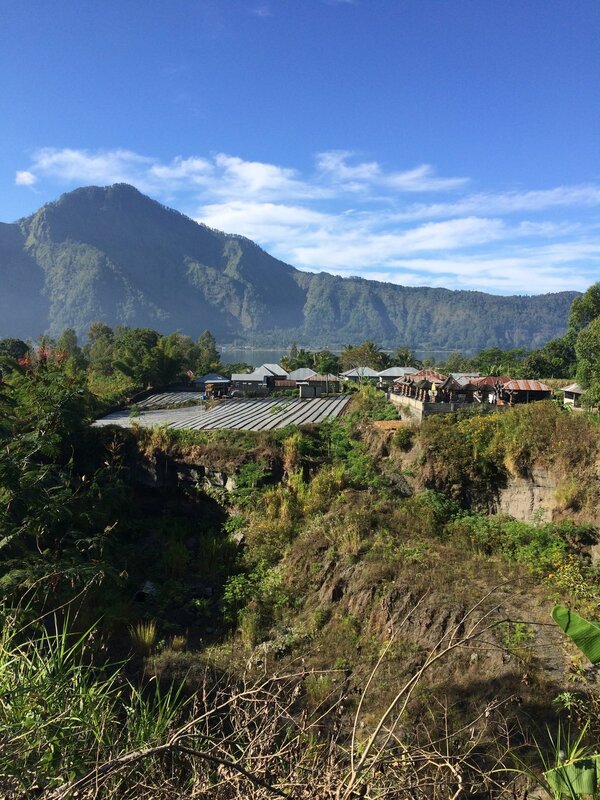 Batur area specifically is so remote and untouched by tourism, as were most parts we drove through. Sadly though, poverty on the island is very apparent. Side view of the serene lake at Mt. Batur. Arriving in Amed, we struggled to find our hotel, even though there is literally only one road through the entire town. Our driver got out and asked a few people (even taking my cellphone with him at one point! ), and we were able to find it that way. We had an ocean view room at Anugerah Villas, which was modest but lovely with the balcony and view. Our view from the hotel in Amed. My actual dream. We had lunch at the hotel, watching their tiny staff wake up from their afternoon naps to make us fresh juice, grilled mahi mahi, and veggies. From there, we treated ourselves to our first full body massage at this beautiful spa in town called Swasti Dewi Salon & Spa. It was the first place we did massages that didn't look like a dingy US nail salon. We began our massage with fresh juice (as is customary) and ended with green tea and...a PUPPY! Snuggling tiny, three-week old Lompak the golden retriever was a trip highlight, for sure. 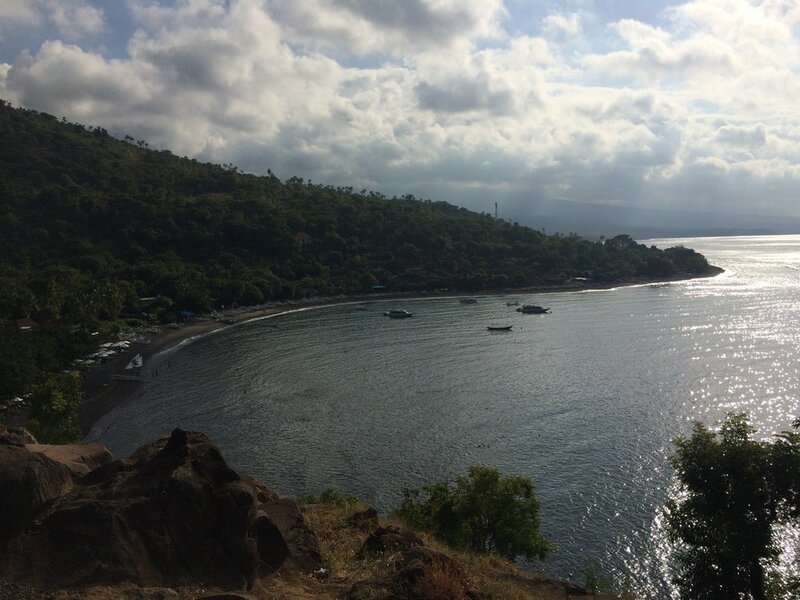 View from the rooftop restaurant at Anugerah Villas, where we stayed in Amed. Tiny puppy friend we met at Dewi Swasti Spa! So much joy in this little guy. We spent the rest of the day riding our motorbike around, sipping mai tais and “zombies” on the black rock beaches, and eating dinner on a cliffside as the sun set. Early bedtime because hiked a mountain today. Sunset on Amed's black rock beaches. Enjoying our happy hour on the beach. Amed was easily one of my very favorite places on the trip. Sleepy, but absolutely beautiful, so charming, and very untouched by tourism. View of Amed from the clifftop restaruant we ate dinner at. Pro Tip IIII: We got an awesome round trip deal to our next destination, Gili T, through our hotel. 500K rupiah total for two people to go from Amed and return via Padang Bai. Kevin was ready to accept the first offer of 800K per person. The best deal is usually not the first one! Next up, read about our wild 24 hours on Gili T!